So, this year has kind of flown by huh? An absolutely hectic summer put a stop to not only me writing but also my Sonic playthrough. I did manage to play through a few other games though and I’m trying to get back into the swing of things with an old standard subject of my Tech Site blogging days – game shows. In particular, the big one: EGX! As we’ve done every year for the last 6 or so years, Dave and I tend to attend a show or two each year. 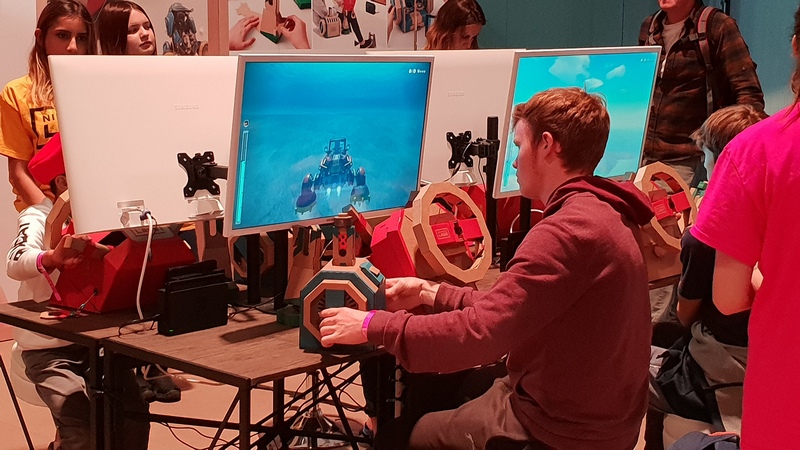 Typically this is one or two of the Play Expo events and in recent years EGX, with this year’s show taking place this weekend just gone. In some ways it felt a little strange to be back at the NEC, as it had become something of a home away from home due to having worked several Insomnia shows there after the event moved from the Ricoh arena before I left CCL, an event that I’ve been meaning to return to as a punter but haven’t yet had a chance to. But, this weekend wasn’t about the past – it was all about the future! 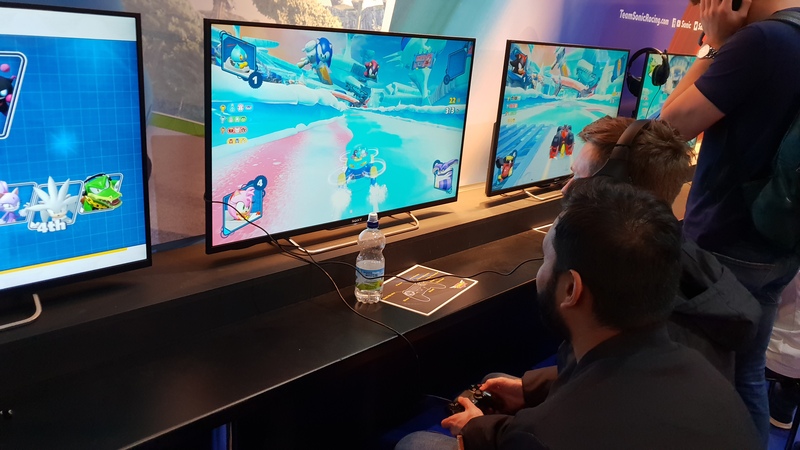 EGX is probably my favourite of the various shows we attend, simply because it’s a showcase of (mostly) upcoming games and a chance to play new titles before they’re released. 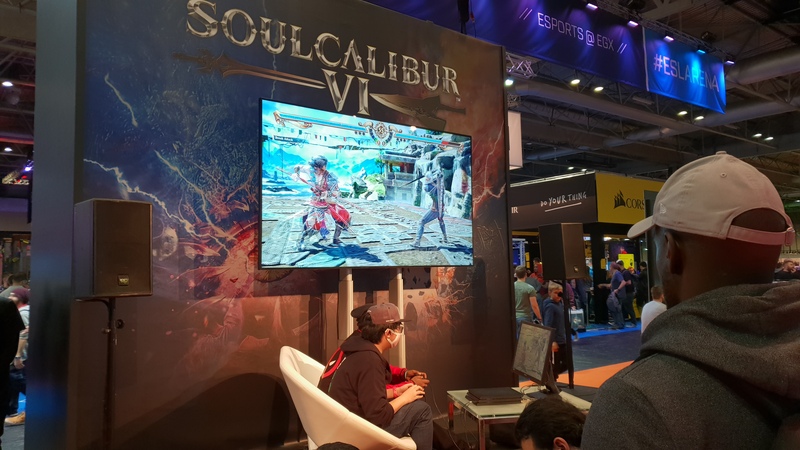 Probably the game I was most excited to try out was Soulcalibur VI. While I’d played the series since the beginning, waaay back to Soul Blade, it was the release of Soulcalibur II during my university years and it becoming a massive part of our gaming rotation that really hooked me on the series. The release schedule has slowed massively over the years to the point that it’s now been over 6 years since the last main entry in the series, so I’ve been very much looking forward to playing it since it was announced. And thankfully, it didn’t disappoint! We played a few matches, and very quickly it felt like 2002 all over again. While the demo version didn’t feature the full character roster it did include most of the series mainstays, and I played rounds as Mitsurugi, Sophitia and Nightmare who all played a lot like my memories of the older games. Great gameplay coupled with the gorgeous graphics make this high on my list to buy on release. Next on my list was, of course, Sonic Team Racing. As anyone who reads this or knows me will likely be aware, if a new Sonic game comes out then I’m going to pick it up (and by now I pretty much have to for the playthrough!) and if it’s going to be something that I actually enjoy then even better! The version on demo didn’t feel like it was final code and perhaps had some kinks to be worked out, and I don’t know if it has different performance based on the choice of speed/difficulty like a Mario Kart would, so something didn’t quite feel right about it. There’s still time before release though, and developer Sumo Digital were responsible for the two previous Sonic All-Star Racing titles that I enjoyed greatly, so I’m hopefully it will end up coming together. 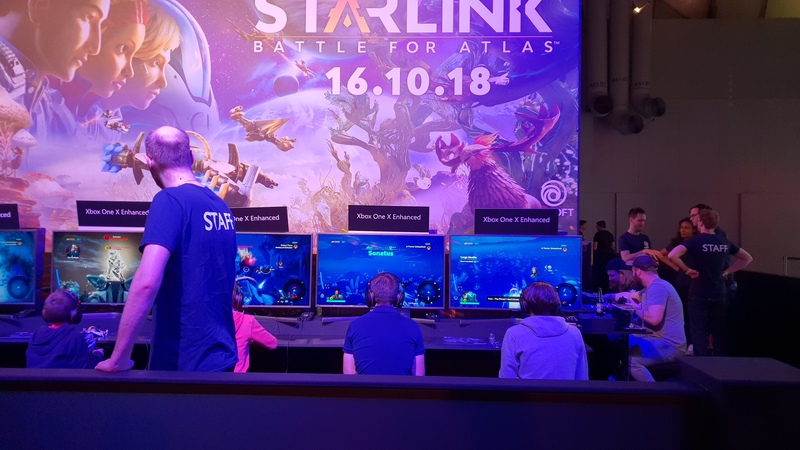 Another title I was quite interested in seeing was Ubisoft’s Starlink: Battle for Atlas, not least of all for the Nintendo guest character.. Seemingly Ubisoft’s attempt to get into the now dwindling toys-to-games market (RIP Disney Infinity and LEGO Dimensions) kind of feels like it’s coming a little late but was something I had to check out anyway. The gimmick is that you select a pilot, ship and weapons and these all join together onto an adapter on your pad and are represented in-game. Gameplay wise it was pretty cool and all controlled pretty well. 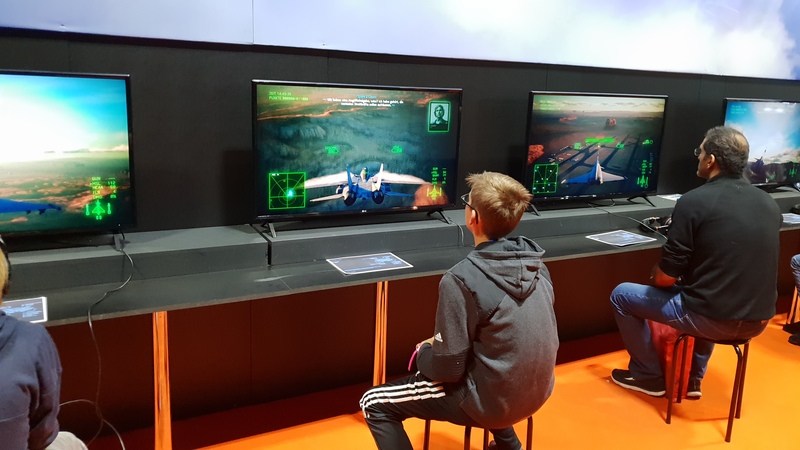 I tried out the Nintendo Switch version which, while lacking a little in the visual quality department, more than made up for it by having an exclusive Arwing ship and Fox McCloud pilot, though he wasn’t available to try. 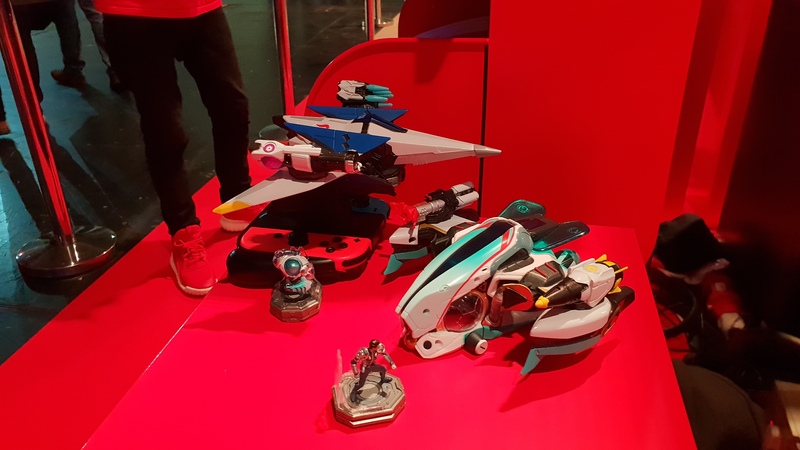 The ship models were very nice, chunky things that feel like they’re going to cost a fair bit (though I’ll be honest, I’ve not seen any price tags) especially if you’re wanting to get everything. It all worked really well though, and the various parts all locked together in a satisfyingly solid way, and I liked how you could change the ship’s weapon attachments on the fly depending on what you were fighting. It’s definitely something I definitely feel I could sink a bunch of hours (and money) into.. except for the fact that it’s only releasing on the Xbox One and Switch, and I don’t own either yet. Finances bullet dodged, I guess? There was one last game on my list that I absolutely HAD to try, and that was Ace Combat 7. I really enjoyed the divisive Ace Combat: Assault Horizon when I played it last year, so I’ve been quite looking forward to seeing how the latest entry turned out. The demo had a choice of a couple of fighters so I went with the good old classic F-14 and proceeded to spend the 10 minutes or so of the demo blowing up everything in sight with a gorgeous looking plane. Can’t wait! 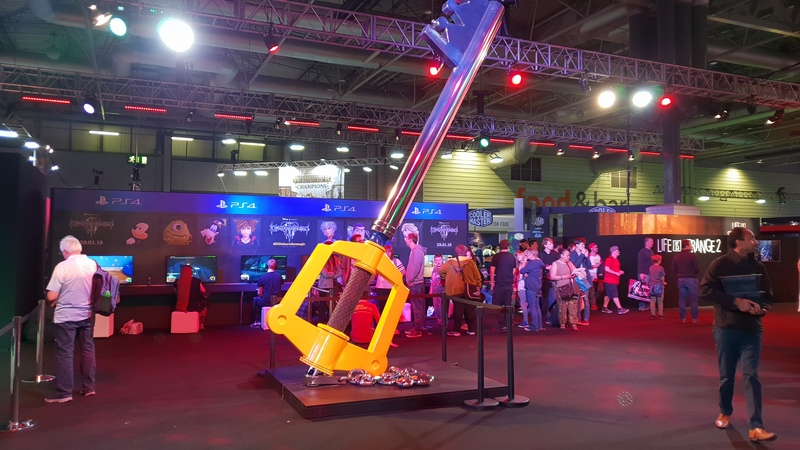 Over at the Square Enix part of the floor, a lot of effort was being put into promoting Kingdom Hearts 3. I’ve not played any of the previous games, so it’s not something I was particularly interested in giving a try, but I know Dave is looking forward to it. As usual for me, I tended to steer clear of queueing for games that are already out, such as Shadow of the Tomb Raider, and there were quite a few featured this year. Mostly these games haven’t been out too long so I understand the point of advertising them but for me the show is all about games that aren’t out yet. 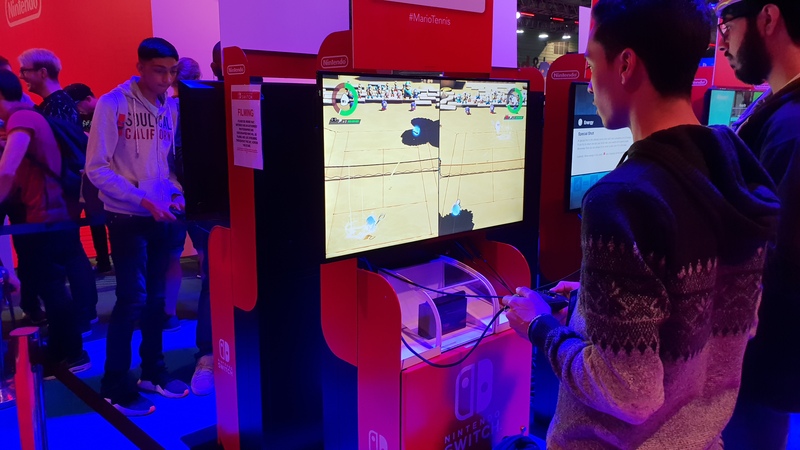 Nintendo had the majority of the Switch catalogue available to play, including a huge section for the Labo cardboard toys, and we had a game of Mario Tennis Aces which I was absolutely abysmal at. I did really want to play Super Smash Bros. Ultimate but the queue for it was huge every time I walked past so I gave it a miss. Might it finally be the game that makes me pick up a Switch though? Over in the indie games section there were a number of upcoming titles that caught my eye, as well as a bunch of games that I’d seen and played before such as Mega Drive platformer Tanglewood (which I should probably get around to picking up at some point) but there were two in particular that I wanted to talk about. The first was mid-90s Lucasarts style point and click adventure 3 Minutes to Midnight. 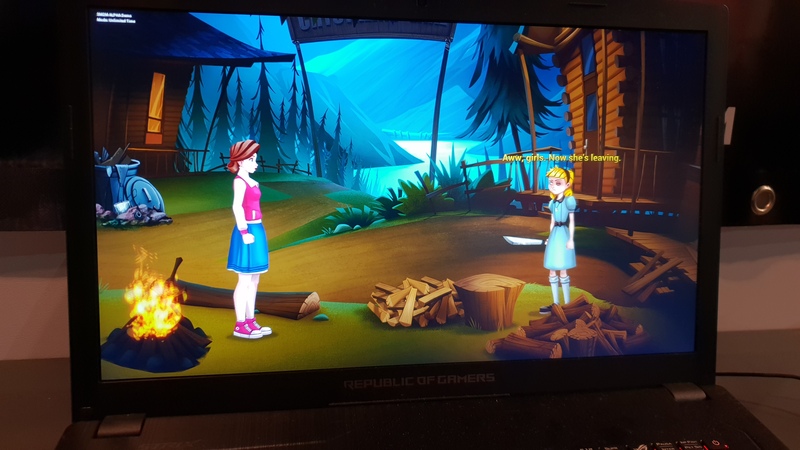 The section of the game available in the demo didn’t really give any indication of the actual plot, which is fine, but it did give a good idea of how the game will play and look and it’s very much in the style of Monkey Island or Broken Sword. Which is great, I love those games! It’s got some decent dialogue and voice acting, nice looking artwork and based on the trailer at least it’s going to be pretty bonkers. Definitely one that I’ll be keeping an eye on. Speaking of bonkers, the other game I was particularly taken with was the absolutely crazy What the Golf?. At first glance it looks like just another golf game, until you take a shot and you start putting the golfer, or the hole, or a house.. The demo went through perhaps 20 different scenarios with all kinds of different things going on, Portal and Superhot inspired levels and general madness. I’m sure the full game is going to be a lot of fun when it releases next year. Games weren’t the only things to be found on the show floor however. 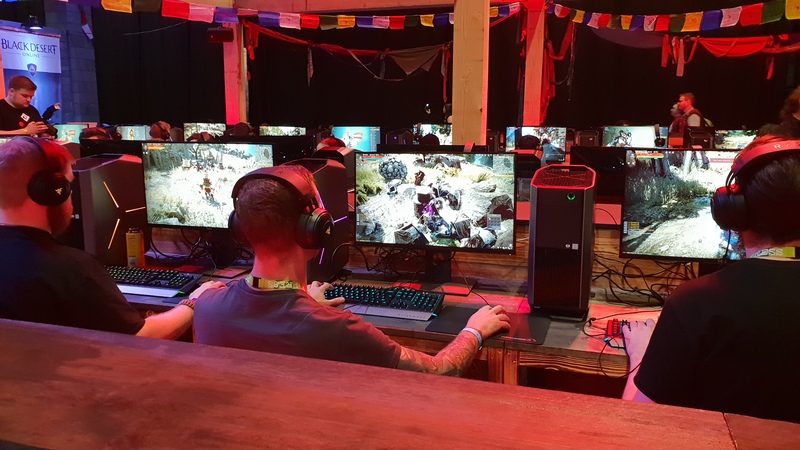 This year there was a significantly increased presence of PC hardware vendors and system integrators, the kind of exhibitors I was much more used to seeing at the Insomnia events. 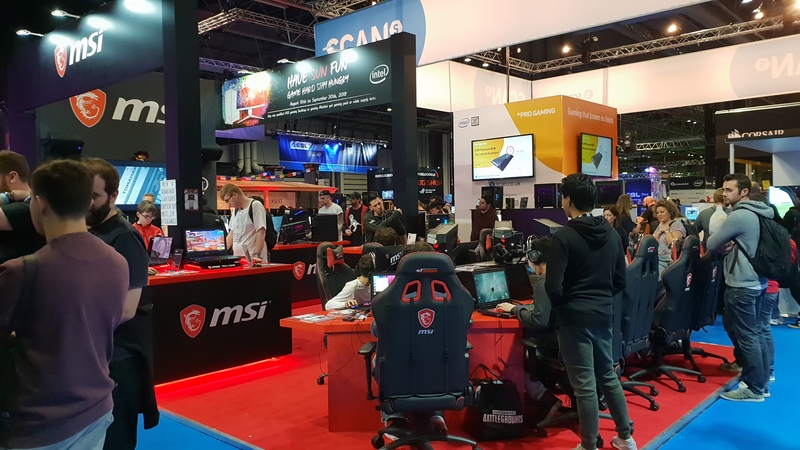 Most of the bigger retailers were present as well as big players in the PC business such as Corsair, MSI, Cooler Master and Asus. While I’m not as heavily into the hardware side of things as I was when I used to work at CCL so didn’t get as much out of displays of new kit as I once would have, it was good to see a number of people I know from working the Insomnia events working the stands. Working these shows is probably the thing I miss most from my CCL days, as most of the people I’ve gotten on pretty well with most of the people I’ve met working them. Cooler Master and MSI did both have some pretty cool looking systems on display though, with some chassis designs that don’t adhere to typical standards. 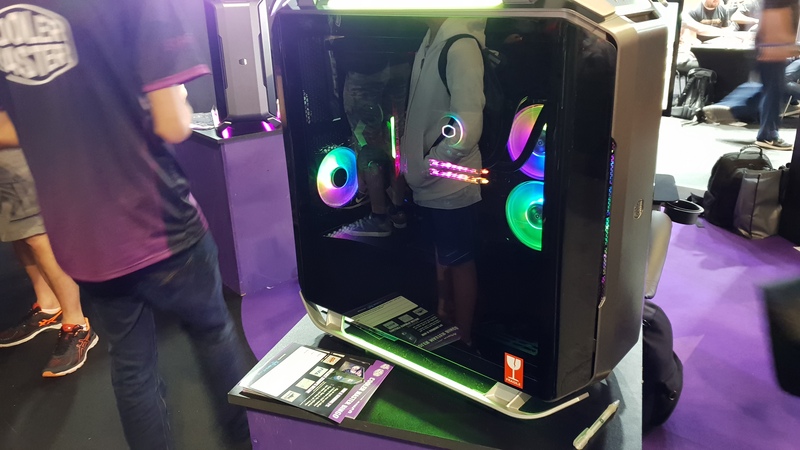 MSI have a small form factor gaming PC that can take a full size graphics card mounted on a PCI-Express riser in a way that results in the card being visible through the right hand panel of the case. Cooler Master meanwhile were showing off a few PCs in a glass sided case (which I didn’t catch the name of) that allows the builder to mount the motherboard so that all of the I/O ports are at the top of the case, concealed by the removable top panel of the case. The cables could then be routed to the bottom of the case, almost completely hiding any cables from sight. Finally, there was the usual assortment of merch and retro games that tend to appear at most events. I managed to hold off spending much and we didn’t really spend much time in that part of the event. 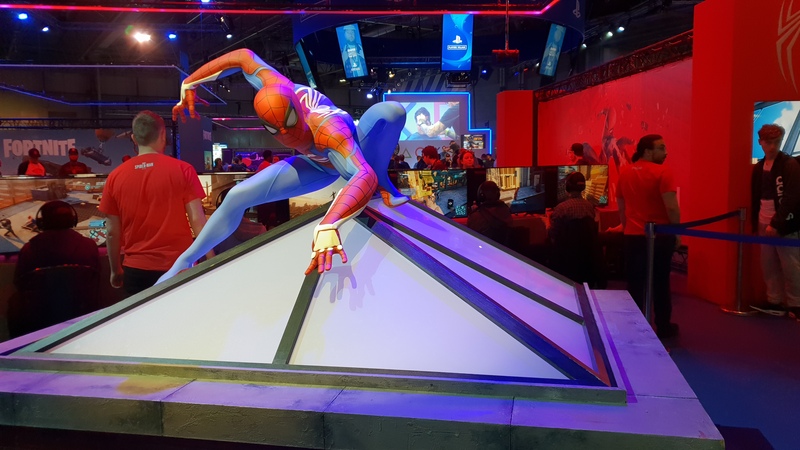 All in all, EGX 2018 was another good year for the show and has given me many games to look forward to. Roll on next year! By 1995 a few years had now passed since the success of the Mega Drive Sonic games, and Sega were looking to continue the series through new platforms. With the Saturn in development, another Mega Drive addon was created to try and extend the machine’s shelf life to fill the gap until it was ready – the 32X. Mostly though, 1995 was the year of the Game Gear spinoffs without any real ‘main’ game for the first time, something that we’d sadly need to get used to over the next couple of years.. Starting the year surprisingly strong, the Game Gear sequel Sonic Drift 2. The first game was rather unexceptional but, while I’m not quite sure exactly what it was about it that was different, I found myself enjoying the sequel a lot more. Released over here without the ‘2’ so as to hopefully not confuse people as to what had happened to ‘1’ (though the number remained on the title screen) this was to Western audiences at the time the first Sonic racing game. In terms of control and style it’s very similar to its predecessor, but the larger selection of characters and increased variety of tracks really help make it stand out. The only game of the year not released on the Game Gear was one of the flagship titles for the 32X, the year’s latest Mega Drive addon. Hoping to drive sales for the hardware with a Sonic game, the odd decision was made not to feature him and instead make the first (and only) Knuckles solo game. And so we have Knuckles’ Chaotix. Fans have torn apart the game and various beta versions for years trying to find out the full history of the game and it appears that Sonic and Tails were present in early versions prior to it being turned into a Knuckles game. And it’s quite the odd game. While on the surface looking a lot like the logical continuation of the Sonic 3 art style, it doesn’t really play much like many Sonics of the past due to the ring bond between the two characters that fundamentally alters the physics and gameplay. The stages are also typically larger and more bare, with fewer badniks than you’d expect from one of the Mega Drive games and perhaps the biggest change in formula – no lives or continues. It’s got a pretty decent soundtrack and a good (if frustrating at places) 3D special stage, as well as several new characters in the Chaotix team of Vector, Charmy and Espio. They’re also joined in this game by the return of Mighty from SegaSonic Arcade though this would end up being his last appearance – at least until his hopefully triumphant return alongside Ray in Sonic Mania Plus this summer. And we’re back to maddening spinoffs. This was my first time properly playing either of the Tails Game Gear games, and I wasn’t a big fan of this one at all. Tails can fire a ring at enemies while constantly flying but there are so many cheap moments where the level design intentionally kills you, to the point that I started my run twice after dying a couple of times in the training level.. Thankfully it turned out to be quite a short game with only 4 levels, but it’s hardly a hidden gem. Tails Adventures, thankfully, was much better. This time around Tails is starring in a light RPG with collectible items and upgrades that plays pretty well and looks surprisingly good for a Game Gear game. As I mention in the video I cheat a little bit with this one by saving as there’s no lives system, just passwords when you return to Tails’ house that I didn’t want to have to write down every time (though I think I ultimately finished the game without dying anyway) and if you forgot to take note of these passwords while playing back in the day you could very easily lose a lot of progress. That aside though, it’s pretty fun and probably the best example of a supporting character spinoff in the series. And finally for the year, it’s Sonic Labyrinth. Off the bat the concept is pretty dumb – a game that intentionally makes Sonic go slow seems like the complete antithesis of what you’d want a Sonic game to be. The gameplay is pretty clunky and I ended up dying far, far too many times on the bosses but it wasn’t the worst once I got used to it. Certainly not one that I’ll be revisiting any time in a hurry though. As I played through the Sonic games from 1994, I continued reading along with Sonic the Comic. 1994 was a big year for the comic, with Sonic still a massive success for Sega in whatever media they put him into. The release of Sonic 3 early in the year allowed the comic to do an adaptation of a major Sonic title for the first time. The year gets off to a fairly rough start with the story Sonic the Human that’s just never worked for me at all. It all ends up being a Robotnik induced hallucination, but what’s the point of a Sonic story where he isn’t Sonic? It didn’t go down very well with readers either, and ended up being writer Ed Hillyer’s first and last script. The team also introduced Captain Plunder and the Mystic Cave Pirates, who would return a number of times over upcoming issues and eventually end up with their own series. While the crew lineup would change down the line, the two most memorable are Plunder himself and his sidekick Filch – who is now a ghost after being killed by Plunder, though Sonic ends up not believing in ghosts a number of issues later. Those stories were just a warmup for the epics to come however, as they were soon followed by the five part ‘The Sonic Terminator’ which adapted the events of 1993’s Sonic CD before moving on to Sonic 3 over the course of six issues – they’re technically titled as three two part stories, but that’s not how they read. These two stories are what I remembered most of Sonic the Comic from reading it as a kid, and they still hold up really well all these years later. Elson’s art on these stories in particular are what formed my mental image of the characters for so many years to come. The Sonic 3 story of course introduces Knuckles, and sets up his long (and originally not so friendly) rivalry with Sonic, as Robotnik had tricked him into thinking that Sonic was the villain. Kitching also wrote a number of stories illustrated by other artists, including the standalone story The Sentinel which somewhat impressively would end up being followed up on over 100 issues later..
1994 also saw Lew Stringer join the team as alternating Sonic writer with Kitching, and the two would write the vast majority of the lead strip for the remainder of the comic’s life. While I enjoyed some of his later strips, I’m not too fond of Stringer’s early work and in particular his pet character Metamorphia who features in the first two. 1994 saw a huge increase in Sonic related stories in each issue. The final issue of the year, the larger sized issue 41, featured six stories of which three were Sonic related – including Amy’s first solo story penned by Stringer. Amy wasn’t the only one though as Knuckles began a first solo story from Kitching and Elson while they took a break from the main strip featuring, unfortunately, the Marxio Brothers again as they set up the Carnival Night Zone on the Floating Island. Tails wrapped up his first series from the previous year and would go on to have several more goblin fighting adventures in the Nameless Zone before ending up back on Mobius in the Chemical Plant Zone to become the trenchcoat wearing Zonerunner. There were also several stories published under the Sonic’s World banner. Initially these focused on the history of Mobius, Sonic and Robotnik before becoming additional stories that followed other characters. The first story in this manner followed Burt and Cam of B.A.R.F., Robotnik’s Badnik repair team.. Somehow as a kid I don’t think I ever noticed Burt constantly referring to the Buzz Bombers in the story as Moto Bugs, I guess he could do with the Badnik Spotter cards that were given away later in the year, as could the editors of some other stories as it’s not the only time this mistake is made. Meanwhile, despite the increasing emphasis on Sonic and crew, there were still plenty of stories based on other game properties. Ecco and Golden Axe wrapped up both of their stories from 1993. Ecco would eventually be back with a sequel, but unfortunately that was the last we saw of Golden Axe – despite the last part ending with the promise of more. The first completely new series of the year, Eternal Champions ended up having two stories over the course of the year. The first featuring all of the team members, while the second focused on arguably the two leads from the ensemble, Larcen Tyler and Shadow Yamoto. The first story begins with Brian Williamson on art before being replaced with Shinobi‘s Jon Haward, who then returned for the second story. A fairly straightforward comic at first, Haward brought his distinctive style to the series and improved it substantially. The Eternal Champions also got their own special issue near the beginning of the year to introduce the characters and setting to coincide with their series starting in issue 19 that had three new stories. I believe this was part of a big push by Sega for the game’s PAL release in early 1994 (I recall most Sega themed games magazines at the time making a really big deal of it) as they hoped that the game would be popular enough to stick around for multiple sequels.. It almost worked, with a Mega CD sequel being released in 1995 and a couple of spin-offs, but by the time the Saturn rolled around the series was never seen again. Despite their high profile, the Eternal Champions didn’t appear in STC again after 1994. The final series from the first issue, Shinobi, made a comeback in 1994 as well. Joe Musashi continues his war against the evil Neo Zeed organisation, this time taking the fight to the enemy and attacking their headquarters to rescue his girlfriend. Jon Howard continues to draw the series, pulling double duty with finishing off Eternal Champions as both series were running at the same time. Next, we had a return of one of the second wave of stories, Streets of Rage that actually had two storylines start this year. First was Skate’s Story, which introduced the popular Streets of Rage 2 character. Still quite an enjoyable read, the series continued to be somewhat more violent than pretty much anything else in the book. This would turn out to be Mark Millar’s last story for the series, as Nigel Kitching would take over and pen all future appearances of the team. Right at the end of the year, the third storyline ‘The Only Game in Town’ began, which would finish in 1995. Wonder Boy was also back for a second story, this time adventuring in Ghost World. As with Golden Axe this would also be his last appearance. There’s no giant death mushroom this time sadly, though there are ghost dinosaurs so I guess that’s ok.
Rounding out the returning series, was another Decap Attack story. I still couldn’t get into it at all. Maybe I should give the game another try? By far the strangest story of the year (and probably the entire run of the comic) was Pirate S.T.C. To this day I’m still not quite sure what this series is actually about, and it features the ‘Demon Barber’ character and skull logo from the Sega Pirate TV advertising campaign. A comic about an advert about games that the comic is based on.. what? Next up, and looking like the most sensible and normal strip by comparison, was Mutant League. Based on the game of the same name, which has just this year gotten a sequel/re-imagining, it features mutants (shocking, I know) playing a futuristic version of American Football. Sports games and stories don’t really do anything for me so one that I mostly glossed over. Finishing off the year, the ‘mega sized’ issue 41 featured two completely new stories. One was the first part of Marko’s Magic Football which is about a kid called Marko with, you guessd it, a magic football. As with Mutant League, having never been a football fan as a kid or played the game, another one that completely passed me by. And last of all, series host Mega Droid got a story of his own. Set as a behind the scenes look at a fictionalised version of the Sonic the Comic offices, Mega Droid takes readers on a tour before ending up answering letters for the letters page. 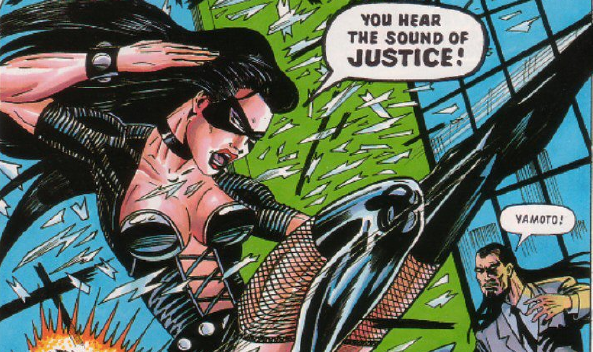 As well as the regular comic and the Eternal Champions special, 1994 saw a number of other spin-off issues. The Poster Mags continued throughout the year, and now featured a short comic strip on the other side of the poster. Seven issues were published in total, with five Sonic stories and single issues of Streets of Rage and Shinobi. These all featured standalone stories, and had no bearing on events of the various ongoing strips. The final Poster Mag of the year was also the last issue of that series. Finally, summer saw publication of a holiday special. Included were a number of text pieces such as a history of Sonic and a fictional interview with Doctor Robotnik, and of course some comics. A two part Sonic story bookended the issue with solo stories for Tails and Doctor Robotnik in between that were all largely forgettable, but the most noteworthy piece was a four page Knuckles story that directly led into his then upcoming appearance in the main comic. 1994 took me a bit longer to get through than expected due to a combination of working out how to actually play the Pico games, Christmas and putting off one that I really didn’t want to suffer through (Sonic Spinball) but I finally got there in the end. Starting the year off strong Sonic 3 introduces everyone’s favourite meme machine, Knuckles. Initially Sonic’s enemy due to being duped by Dr. Eggman, Knuckles will of course eventually become one of Sonic’s most common allies. Sonic 3 is a gorgeous game even now, with some great artwork and level design. The music is also really good, it plays great and.. well, I just wish the rest of the games released in 1994 were as good. The first of Sega’s many, many attempts to try and come up with a Sonic game to counter Mario Kart, they immediately hobbled it by making it a Game Gear game instead of a Mega Drive one. This first Sonic Drift is a pretty barebones affair, featuring only 12 tracks and 4 racers and mediocre gameplay so there really isn’t an awful lot to recommend it. It does however feature the first playable appearances of Amy Rose and Dr. Eggman so that’s something. This is another of the ‘oddity’ entries that only get classified as Sonic games on a technicality. Despite being central on the cover art, Sonic barely features as all aside from being the home screen cursor, though Tails does at least get some animation. It’s essentially a really basic (at least by modern standards, maybe it was interesting back in 1994) interactive sticker book, you can place what are effectively stickers of a number of Sega characters and other weird things onto one of several different landscapes and colour and animate them. And that’s about it! Noteworthy for being Tails’ first title role and solo appearance, Tails and the Music Maker isn’t really worth remembering for much else. A edutainment title for Sega’s Pico platform, it comes with a simplistic several page book that shows different locations for Tails to interact with. Changing the page on the book also changes what you see on screen. So far so good, but unfortunately the minigames that you play on each page are at best incredibly average and generally not even that good. To make matters worse, it sounds pretty bad too which would seem to be the exact opposite of what you’d want a music game to do. Very similar in structure to Tails’ solo game, Sonic the Hegehog’s Gameworld is another collection of fairly simplistic minigames for the Sega Pico. I thought this one was a bit better, with I’d say improved graphics as well as better games but there’s still really not a lot to it (though of course I’m nearly 3 decades older than the target audience). It also sounds better, which doesn’t do the music based game any favours. Thought I’d already played this? Yeah, me too. After Dave mentioned he’d seen a speedrun of the 8-bit version of Spinball and that it was different I had to check it out to confirm and unfortunately he was right. While it largely follows the layout of the Mega Drive version, there are some different bosses, special stages and of course everything was made from scratch as the 16-bit assets couldn’t simply be ported over. Meaning, by my own criteria, it’s a distinct separate game and I should play it. Ugh. Thanks Dave. While the Mega Drive game can be frustrating for its difficulty, the 8-bit version is frustrating for everything else. The addition of continues means its not actually hard to complete, but the awful controls, wonky physics and complete misunderstanding of how momentum works make it a chore. It’s just a bad game. Sadly, I doubt it’s going to be the worst I end up playing on this playthrough..
A superb palette cleanser after the garbage that came before, Sonic & Knuckles is essentially Sonic 3 Episode 2. I play the two games separate for the purposes of this playthrough, and as I didn’t really want to have a third run of the two locked together I instead just pick up a Sonic 3 & Knuckles save at the end for the bonus final zone. Just like Sonic 3, it’s still a good looking game that plays and sounds just as great now as it did in 1994. Plus you get to play as Knuckles! The only real downside is that it’s the last proper 16 bit Sonic we would get. Another one that I’ve long known about and own at least one copy of, I’d never actually gotten around to playing Triple Trouble before. I was pleasantly surprised at how good it was, with graphics that are a step up over the previous 8-bit platformers and some pretty good levels. While prominent on the artwork, Knuckles isn’t playable here and instead just functions as the deuteragonist and eventually becomes friends with Sonic at the end – the other two opponents who make up the titular trouble being Nack the Weasel/Fang the Sniper and of course Dr. Eggman. Nack in particular is an interesting character, simply because of how much he’s remembered as being a big thing from this era despite not really amounting to anything. Much like Sonic & Knuckles before it, Triple Trouble was the last proper classic 8-bit platformer. The end of an era.. While playing some of the earlier Sonic games for my playthrough, I thought it might also be fun to re-read the Sonic comic that I remembered fondly from the time. Sonic the Comic was launched by Fleetway Editions in May of 1993, while the Sonic games were arguably at their peak of popularity. Following a similar format to many other UK comics at the time, STC was a 30 page fortnightly series that featured several 5-7 page comics per issue as well as a number of features such as game reviews, news and of course a letters page. While most of the comics were rotating features, as you can probably guess from the title every issue opened with a Sonic story. Later in publication, the stories based on other games were less common, with 2-3 Sonic related stories regularly appearing in each issue. 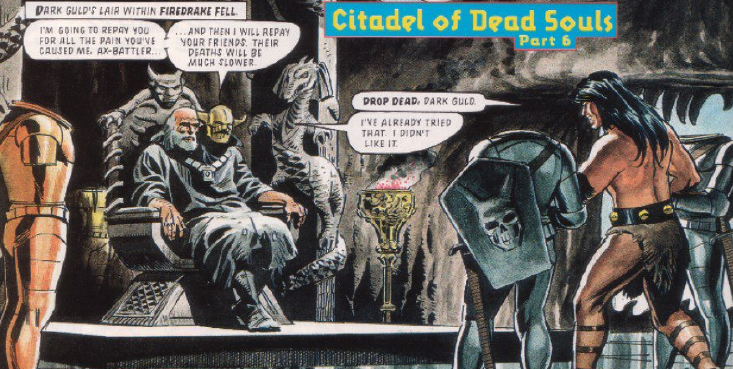 Much like 2000 AD’s Tharg, each issue also featured the host character Mega Droid who introduces the issue as well as answering the letters page. The first issue featured the Sonic story Enter: Sonic which acts as a largely standalone introduction to the character (though does end with a plot thread that’s picked up in the next issue) as well as the first part of Shinobi and Golden Axe stories. Rounding out the issue are several pages of reviews, a news feature which highlighted the then upcoming Mega Drive and Mega CD 2 hardware updates, tips and a preview of the two new strips that would be starting in issue 7: Streets of Rage and Kid Chameleon. The very early Sonic strips are largely forgettable affairs, with changing writers and artists each issue. It’s not until issue 7 that we get the first Sonic story from Nigel Kitching and Richard Elson, the team who will end up being the primary Sonic creators for the life of the series. Over their initial four issue run, Kitching and Elson introduce Super Sonic, cover the origin of Sonic and Robotnik (which is largely in line with most versions of the contemporary western backstory) and have Sonic end up several months in the future where Robotnik has taken over Mobius in his absence. These four stories are definitely the high point of the first year of Sonic comics, and clearly readers at the time realised this too as the more simplistic standalone stories became less and less common over time. One thing that is quite noteworthy about the stories not by Kitching and Elson from this era is that some feature very early work by now comics superstar Mark Millar though sadly, these are among the worst of the Sonic stories. It’s certainly not helped by the fact that the majority of Millar’s stories have different artists, and feature some of the worst artwork seen in the first year of the series. Most of the characters don’t quite have their established personalities at this point in the series and while Kitching was also guilty of it at times, Sonic under Millar seems to lean too far into the ‘Hedgehog with Attitude’ slogan of the series at the time to the point that he’s pretty much entirely unlikable. Sonic’s Super Sonic alter ego is also completely different: unlike the games which depict him as simply Sonic but powered up, the comic instead has him as basically a deranged psychopath – something which will become much more pronounced in future stories. Tails is also noticeably out of character compared to modern versions as he’s regularly portrayed as dumb and clumsy instead of the genius inventor he is these days – a role that will be played by Porker Lewis later in the comic. Millar’s stories also were apparently written in a batch early in the series’ production, aside from a footnote at the start of each that mentions that the planet is ruled by Robotnik this doesn’t feature in the dialogue. Tails is largely useless in these early stories as he’s regularly being rescued by Sonic though he does get his own solo series at the end of the year where he does a bit better. Aside from the Sonic stories, most of the Mega Drive’s biggest titles of the time all have stories. In the first year of the comic Golden Axe, Shinobi, Streets of Rage, Wonder Boy, Kid Chameleon, Ecco the Dolphin and Decap Attack all have stories. 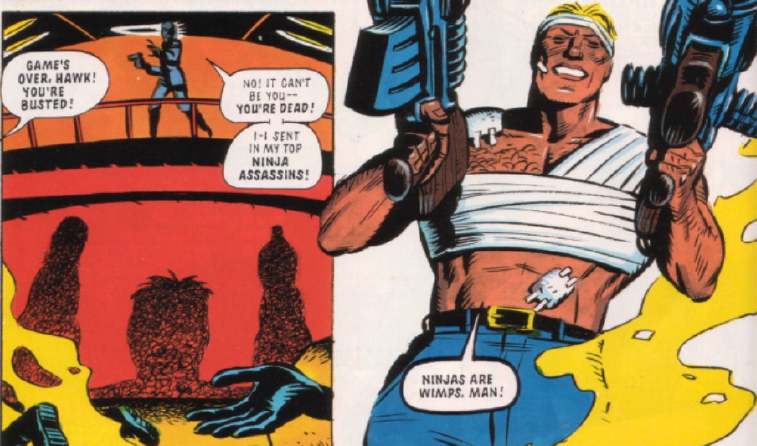 The first non-Sonic story in the comic, Shinobi follows the titular Shinobi Joe Musahsi on his mission to defeat the evil Neo Zeed and save his girlfriend. This is a pretty fun comic, and has stylish artwork from Jon Haward. A favourite game series of mine, the Golden Axe strip is another enjoyable one. Featuring all three of the main characters and with a comedic tone, the story follows on from the end of Golden Axe 2. A second series that followed on from this one began with issue 13, but this was sadly to be the last Golden Axe story in the comic. Wonder Boy was the first series that I couldn’t really get into that much. I think it may be that I didn’t really play any of the Wonder Boy games as a kid and so didn’t have any real affection to the character. It’s not a terrible story and the art was fairly decent though. Plus it had a giant death mushroom, so that’s something. Streets of Rage is again by Mark Millar, though he’s a much better fit for the series than Sonic. Featuring a fair amount of violence for a comics arguably aimed at younger readers and with some quite cool art by Peter Richardson, it’s a pretty fun series that made me think fondly of one of the better Mega Drive series of games. Kid Chameleon is based on the story of the game, and follows Casey who gets trapped inside a video game and can turn into different characters. The characters are all completely different types and genres which doesn’t really make all that much sense, but hey the ’90 were simpler times..
After a pretty rocky start with some sub par artwork, the first Ecco the Dolphin story really picked up with the shift to some lovely painted artwork by Steve White. An expanded adaptation of the first Ecco game, it has a scene where a dolphin is being carried in the sky by a Pteranodon. Sold! The last new series (aside from Tails’ solo story) to debut in the 1993 is also probably my least favourite, Decap Attack. I’m honestly not quite sure what it is about the series that I didn’t like, as I like Nigel Kitching’s writing usually. It’s another series where I never got into the game that it’s based on though, so that could be it. The latter end of the year also saw the publication of the first two issues of the spin off Poster Mag title – these two issues didn’t contain any comics however (that starts with issue 3) and just acted as additional news and information about the series with the first issue in particular being worth mentioning due to showing artwork of a prototype Sonic cartoon that never aired. Sonic the Comic of course wasn’t the only Sonic comic of the time. Over in America Archie Comics were publishing Sonic the Hedgehog, which closely followed the setup of the darker Sonic cartoon and featured characters like Princess Sally, Antoine and Bunnie. This Sonic series outlived STC by a long stretch, and only ended in 2017 when it disappeared from Archie’s schedules. I never read this Sonic series back in the ’90s, coming to it about five years ago so as it’s not the one I have nostalgia for I won’t be covering it. Sonic’s first full length arcade outing, SegaSonic the Hedgehog features Sonic and newcomers Ray and Mighty have to escape from seven stages of Eggman’s island full of traps. It’s a game I always wanted to play due to the great cartoon style graphics which still look pretty nice now. It’s a kind of tricky game to play through emulation these due to the original game using a trackball controller and this input mismatch greatly increased the difficulty of the game – the inability to continue at the end certainly doesn’t help either. I’d love to try and track down the original hardware one day and give it another try, and hopefully it would be a little less frustrating that way. Released as a flagship title for the Mega Drive’s Mega CD expansion, Sonic CD will be instantly familiar to players of the Mega Drive titles, using the same art style and very similar sprites for Sonic. The big gimmick is the ability to time travel between the past, present and future of each act – early advertising for the game would tout ‘over 75 levels’ as a selling point which is fudging the numbers a little really as it counts each time frame of each act as a level. While a good game in its own right that features a fantastic soundtrack, Sonic CD is mostly remembered for the introduction of Amy Rose and Metal Sonic. It would be a couple of years before Amy would be seen again, but Metal Sonic became a recurring villain almost immediately, and both now appear in the vast majority of new Sonic titles. The last ‘proper’ Sonic title of the year, Sonic Chaos was the only 8-bit title for 1993. In terms of structure and gameplay it’s very similar to the 8-bit Sonic 2, and consists of three act zones with the third act being a boss area. I didn’t have a Master System or Game Gear in 1993 so I missed this at the time and hadn’t properly played it before, so most of the game was a complete mystery to me going in. Aside from a few new power-ups there were no major new features or characters introduced, but it still provides solid Sonic gameplay and was quite an enjoyable run. As a bit of an oddity, as I discovered on my playthrough, if you don’t find all of the Chaos Emeralds you don’t even get the end credits on completion. Ordered as a last minute fill in for Sonic the Hedgehog 3 as it wasn’t going to be ready in time for the all important Christmas sales window, Sonic Spinball was apparently made within just a couple of months. I definitely remember playing it over and over as a kid and finally being very impressed with myself once I completed it, but looking back it’s a very harsh and unforgiving game. There are no continues, and extra lives are very sparse. The slightest mistake in some areas can lead to death, and if you game over on the last level there isn’t even a password system so you have to start all over again. While that’s not entirely uncommon with older games, it’s not very player friendly by modern standards and I had to start this run several times just to be able to finish the game. The first Sonic title not to feature Sonic himself (though not the last), Dr. Robotnik’s Mean Bean Machine is yet another oddity in the franchise. It wasn’t originally even a Sonic game, but it was decided at the time that Puyo Puyo wasn’t particularly marketable in Western regions so the characters were all scrapped and replaced with Robotnik and a number of his badniks from the Adventures of Sonic the Hedgehog cartoon. The gameplay was completely unaltered from the original game, with you needing to create groups of at least 4 of the same colour beans. Chaining multiple strings of beans is the key to success, as bigger combos will cause solid beans to drop onto your opponents screen and give them trouble. Much in the same vein as Waku Waku Sonic Patrol Car before it, Cosmo Fighter was a short game built into a childrens ride. This time around, Sonic flies a space fighter jet and uses it to shoot through a number of Eggman’s robots before finally confronting him while he’s piloting a dragon mech. With Eggman defeated, Sonic makes it to a space station filled with his friends and celebrates. As I mention in the video, a ROM for this game was only discovered earlier this year making it quite fortunate that I’d not decided to do this earlier. There’s not a whole lot that can be said about this one, as it’s barely even a game. A Sonic branded popcorn machine from Japanese arcades, it’s really more of an interactive animation that plays while the popcorn is being cooked. You mash a button to make Sonic run along a conveyor belt, and then spin a wheel to cook the popcorn, the end. It does feature some pretty nice animation at least, in particular Eggman’s fabulous running. There were just two Sonic games released in 1992, but in no way was it a small year for the franchise. First up was the Master System version of Sonic 2. The most notable element of this of course is that it’s the very first appearance of Sonic’s best friend and sidekick, Miles ‘Tails’ Prower. Terrible pun name aside, Tails is a huge part of what makes the Sonic series what it is, and appears in almost every game from this point on. While Tails is generally characterised as a super smart inventor, here he’s just a plot device. Kidnapped by Dr. Robotnik in the intro sequence, he doesn’t appear at all until the end of the game aside from the title cards for each act. As I mention in the video, the Game Gear version of the game was massively more difficult due to the smaller screen and this was particularly evident from the first boss – you can’t see the balls that are being thrown at you until they’re very close and while I only got ones that were going low they can also bounce higher so you got hardly any time to decide between jumping or going under. I honestly can’t remember if I ever beat it as a kid. It’s also slightly odd in that the bosses are all mechanical animals, you don’t fight Robotnik himself at all until the very end – and even then that’s only if you get all of the Chaos Emeralds as otherwise you finish the game on the Scrambled Egg Zone after beating Mecha Sonic. Much like the 8-bit Sonic 1, the boss stages are all completely devoid of rings, adding to the difficulty quite substantially. Much like the first Master System game the music is pretty solid all the way through, especially the Green Hills Zone which is presumably an early version of Sonic CD’s title track You Can Do Anything. As good as the 8-bit version was, November’s Mega Drive version was the main attraction. Released in a media blitz on ‘Sonic 2sday’ it was a huge success and is widely regarded as one of the very best games in the franchise. For me, it’s always been my favourite. I got it along with a Mega Drive 2, my first brand new games console I’d ever owned, for Christmas that year as it was a revelation. There were more stages that let you run fast and the special stages, particularly for the time, were fantastic looking. While I somewhat intentionally didn’t get all of the Chaos Emeralds on this run (I’d usually play as Sonic by himself so Tails can’t lose any rings in the special stages, and I’d hunt out all the Star Posts in the first couple of stages to get them while rings are more plentiful) collecting them all gave us the first appearance of Super Sonic which absolutely blew me away as a kid but does make most of the game far too easy in retrospect. So, my big new project to take up all the free time that I already don’t have: I’m playing every Sonic the Hedgehog game ever released in (as close as I can to) the order they came out, and streaming them too. After each year’s worth of games I’m then going to collect my streams and write a little about each game. For this first post, it’s of course the very earliest Sonic games. July 1991 marked the release of the the first ever Sonic the Hedgehog game and he quickly became Sega’s new mascot, leaving poor Alex Kidd all but forgotten. Gamers at the time were blown away by the faced paced gameplay, colourful graphics and catchy soundtrack. While I don’t quite feel the speed aspect is quite there yet, particularly after the Green Hill Zone, it still holds up really well and is an enjoyable play. A lot of enduring elements of the series are set up right from this first installment including the Chaos Emeralds and of course Dr. Eggman (although at this point he was called Dr. Robotnik in the West) as well as the iconic rings that I’ve heard jingle several hundred million times over the years. Seeing how massively popular Sonic was on the Mega Drive Sega was quick to make sure that he made it over to their previous console, the Master System. While Nintendo were the market leader in North America it was a different story elsewhere in the world such as Europe where Sega had a sizable lead. Naturally, they wanted to continue this and so a number of Sonic games were eventually developed for the console – lower sales in the States meant that this was the only Master System title released over there and the remaining 8-bit Sonic titles were Game Gear exclusive while we continued to get Master System versions. Featuring a mixture of stages similar to the Mega Drive version as well as entirely new ones such as the Bridge and Jungle Zones, it’s a pretty faithful interpretation of the spirit and gameplay of the original game. Invincibility and barrier power-ups function in the same way, and Sonic himself has the same moves (though at this point really that’s just jump and roll so nothing too complicated) however some small differences like the inability to collect dropped rings and third acts that are entirely roads leading to the boss without any rings do stand out. As you’ll hear me lament if you watch the video, the Master System has a rather irritating mechanic on the second act of the Jungle Zone where the screen is unable to scroll back down. This means that you die if you drop off the bottom of the screen, even if there was a ledge just below you that’s out of sight. The Game Gear version fixes this and makes the stage substantially easier as well as improving the colour palette and some additional animations, at the expense of a significantly reduced resolution. The Sonic series is littered with odd little entries, and this is just the first. Sonic Eraser was released only in Japan on Sega’s online service for the Mega Drive. It’s a rather simple puzzle game and almost certainly had Sonic added to it to make people more likely to play it – other than appearing in the middle of the screen in competitive games and occasionally if you pull off some impressive combos he’s barely in the game and there’s nothing other than his sprite to really link it to the series. Like many Japanese exclusive games from the era, this was once thought lost until Sega re-released it on a Japan only download service in 2004 and it was subsequently ripped to a ROM. The last Sonic game to be released in 1991, Waku Waku Sonic Patrol Car was kind of a cross between a full size arcade cabinet and a kid’s ride that are fairly common in the west. It featured a plastic police car that kids could sit in as well as a screen and steering wheel to play the game. The game itself is very short, taking only a couple of minutes to finish which is about the amount of time most of the western equivalent rides last. For reasons unknown Sonic drives a police car in this game (despite being quicker on foot) and drives up a road. Using the steering wheel you can avoid traffic, and move lanes but there’s no alternate paths to take. Eventually Dr. Eggman turns up, you fight him by jumping from your car to his while avoiding the bombs that he throws and when he’s beaten Sonic returns to the police station and the game is over. While short and largely forgettable, Sonic Patrol Car is notable for being the first time Sonic (and also Dr. Eggman) have voices recorded for them. 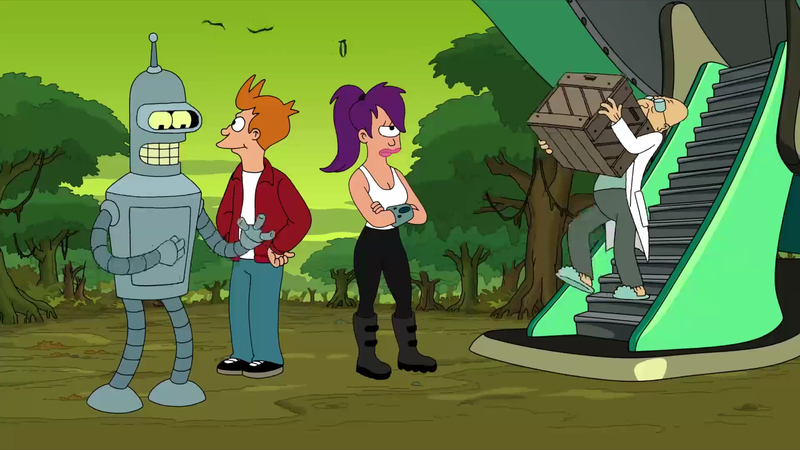 Futurama is one of my all time favourite animated series – I’ve always felt that it’s far superior to The Simpsons and never understood why it’s the one that’s now been cancelled twice, perhaps outside of the fact that science fiction is generally a harder sell that a standard family comedy. So, I generally make time for any new Futurama related things that come along such as the new game Futurama: Worlds of Tomorrow. 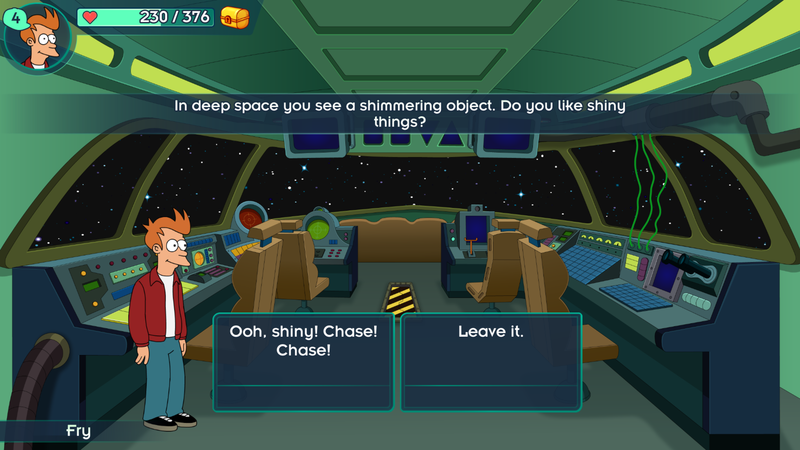 Despite Futurama being around for nearly 20 years now, Worlds of Tomorrow is only the second game based on the series (the last was the imaginatively titled Futurama: The Game waayy back in 2003) and again comes out after the cancellation of the current TV run of the show. 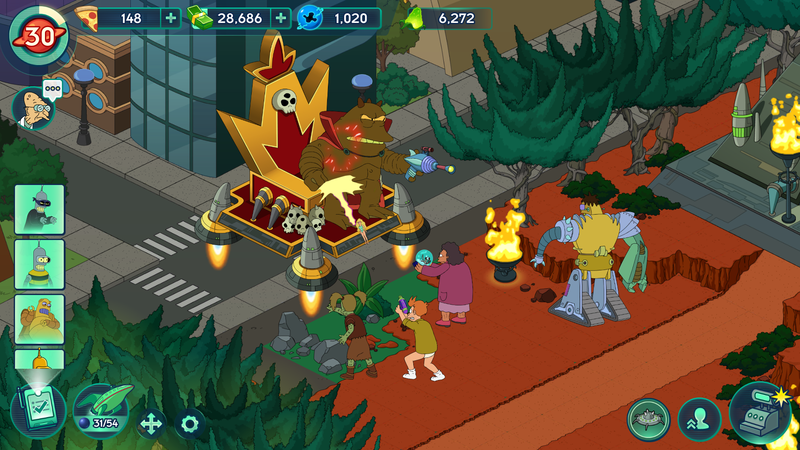 Futurama: Worlds of Tomorrow follows the same basic structure as previous mobile games based on Fox animated properties, namely The Simpsons: Tapped Out! and Family Guy: The Quest for Stuff, both of which have you building a town of signature buildings from the show in question as well as collecting key characters. The characters can then be set on tasks and of varying lengths, as well as story quests which earn ingame currency to buy more buildings and unlock more characters and so on. Having played Tapped Out! several years ago this all felt very familiar, as it’s very similar to that game. Worlds of Tomorrow opens with a fully animated introduction, featuring the voices of all of the main cast of the series, and features the universe once again in danger with only the Planet Express crew to save it. A rip in space and time cause The Hypnotoad to meet his equivalent from another universe and breaks the galaxy. 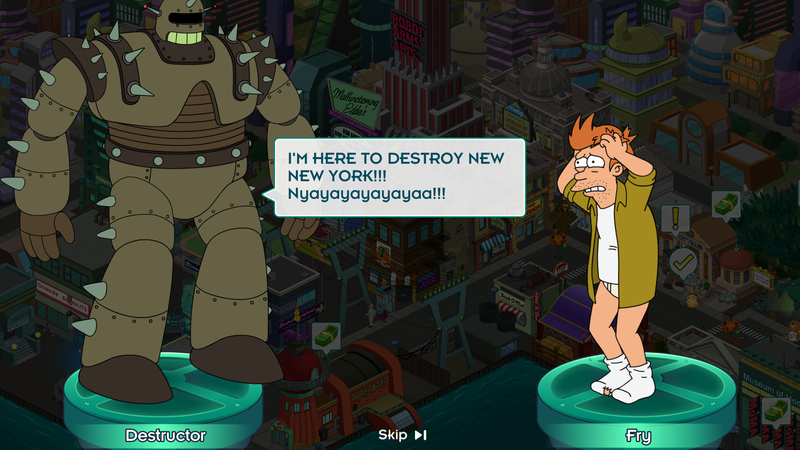 Nibbler saves Fry from being caught up in it and, back in New New York, then has to start collecting Hypnotons to clear the city and get everything back to normal. One major new feature that Worlds of Tomorrow has that Tapped Out! didn’t, unless it’s added something similar since I quit, are the space ship missions. 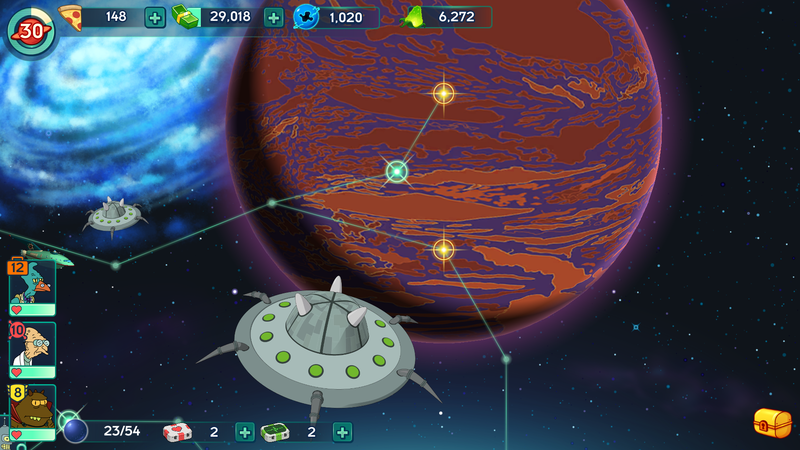 You can use the Planet Express ship to fly to a number of planets and select from a variety of routes through the map which will take you up against different enemies. Completing all of the quests on each planet will unlock and artifact that opens up a new area of the city that has unique buildings and characters in it. The main type of missions that you’ll face in space are turn based battles, where your crew of characters go up against a variety of different monster and enemy types from the show. Initially you can only have three characters on a space mission, but as you collect the artifacts and open up areas of New New York this will gradually increase first to four and then five. The combat is fairly straightforward, as your characters have only a single attack and a special that charges as you take and receive damage. As you attack each enemy, a white circle will appear around their feet which will quickly fill up, tapping the screen as soon as it is full causes your attack to cause extra damage, and you can do the same while being attacked to reduce the damage taken. There are five different types of character class in the game. 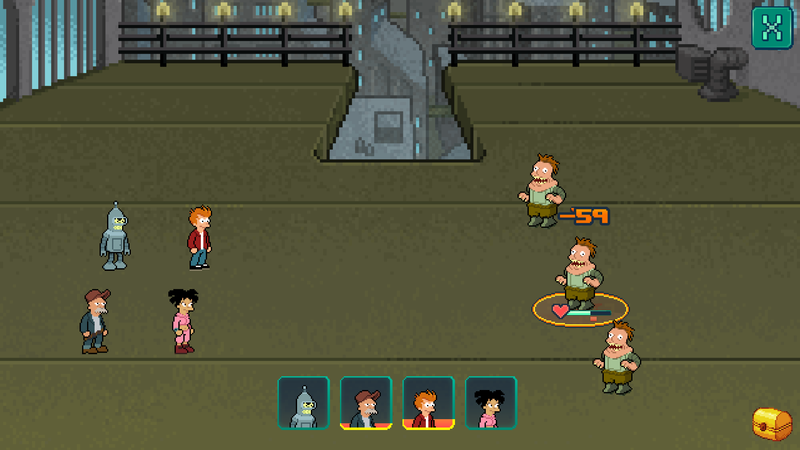 Delivery Boys, such as Fry and Kif, have a single enemy attack with their special being a higher powered version. Scientists like the Professor or Amy have an attack that can hit enemies on either side of the target, while the special attack hits every enemy on screen. The remaining classes all do buffs with the special, and a single attack as standard. 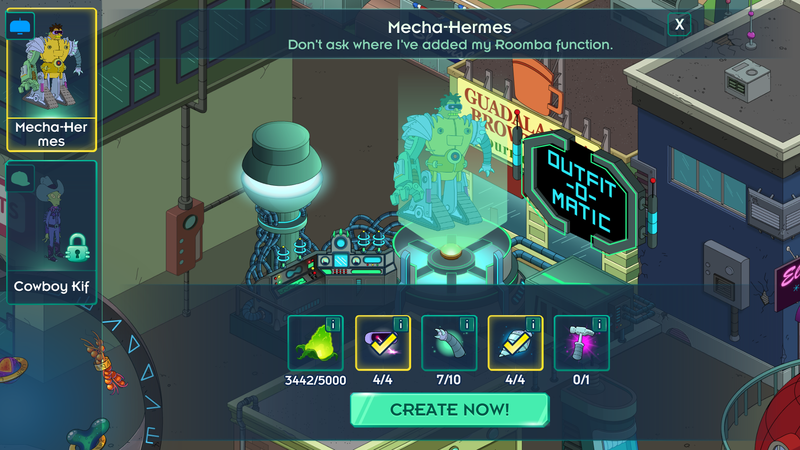 Bender and other Robot class characters have a defense buff, Captains like Leela have an attack power buff and finally Influencers like the Planet Express janitor Scruffy heal all player characters. There are also a number of missions that give multiple choice options on how you wish to proceed or talk to other characters, depending on the choices you make you can end up with either rewards or potentially taking damage. As you complete the space missions you’re given career chips that come in either generic or class specific varieties. These are used to level up the characters to give them additional abilities as well as increasing their health and attack power during battle missions. The majority of the art in the game is very much in the style of the original show. While in New New York you can see all of the characters that you have unlocked and, if you zoom in, the level of detail is actually quite impressive. They’re well animated and look just like the show, and that level of detail carries over to each of the buildings too. I wouldn’t have minded the ability to place some of the travel tubes that you see all over the city in the cartoon around my buildings. Maybe in a future update.. In the turn based battles, the art style shifts to 16-bit pixel art. The characters all have slightly shrunken proportions but are all easily recognisable. I do prefer the clean art from the rest of the game, but it does still look rather cool. When performing a special attack the character picture fills the screen which lets you see them in more detail. All of the main voice cast return to their characters for the game. Each will have a few sayings when clicking on them, and it’s nice to hear new work from all of the actors again. 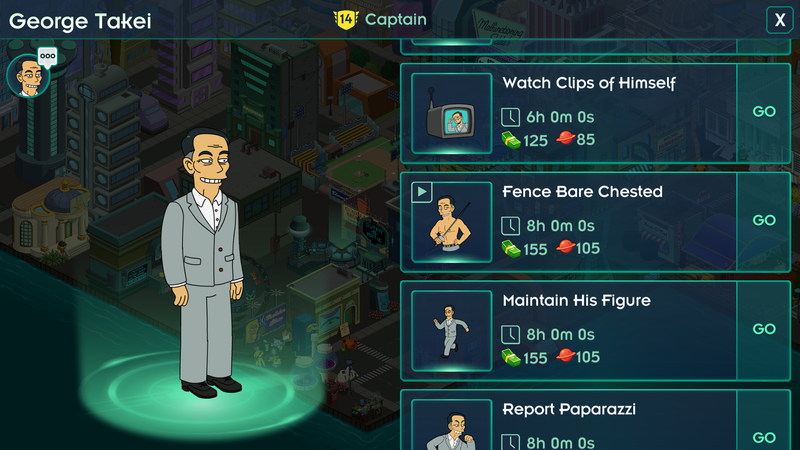 There’s so far been once celebrity guest character, George Takei, and he performs all the voice acting for his character. The music and sound effects are all also spot on Futurama, and it really does sound like the show. Several writers from the show also contribute to the script writing including showrunner David X. Cohen, so as well as sounding right all of the characters speak just like they should too. I started playing just after the launch week which, annoyingly, means that I missed out on the chance to get the Nixon and Agnew character (Arrrooo!) but he was a premium character and only available through the game’s paid currency of pizza – as much as I love the character in the series I don’t think he’s worth the frankly ridiculous £15 of real money he would have cost, so it’s not the end of the world. It does highlight a problem with this game that I also had when I used to play Tapped Out!, that some content and characters are only available during specific events and may not be available at all again in future. 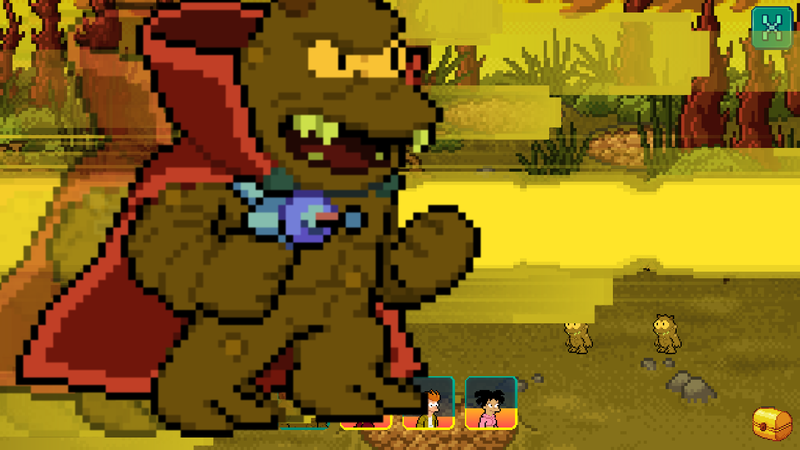 The situation is potentially even worse with the current ongoing event, Lrrr Strikes Back! This massive chunk of new story and content, running for a whole month and labelled as Episode 1, has Lrrr and the Omicronian fleet invade Earth (for the fifth time) and has a number of new missions and actions for characters to complete. The event will be finishing in a couple of days, and it has had nine characters and several costumes that are only available during the event. This is a huge proportion of the twenty six characters available in the game at the moment, and will leave any newcomers at a disadvantage compared to other players when it comes to producing resources through character actions. The game is of course still quite new, so it’s entirely possible that these episodes will be re-run in future allowing new players a chance to experience the story and earn the characters. One of the game’s biggest issues is that it’s one of the least stable mobile games at least that I can remember playing. It fairly frequently just crashes out completely with no error messages, gives random errors on start up (though these don’t seem to have any effect) and perhaps worst of all fails to reconnect if it’s lost internet access – the screen with Scruffy as pictured below has never reconnected for me. 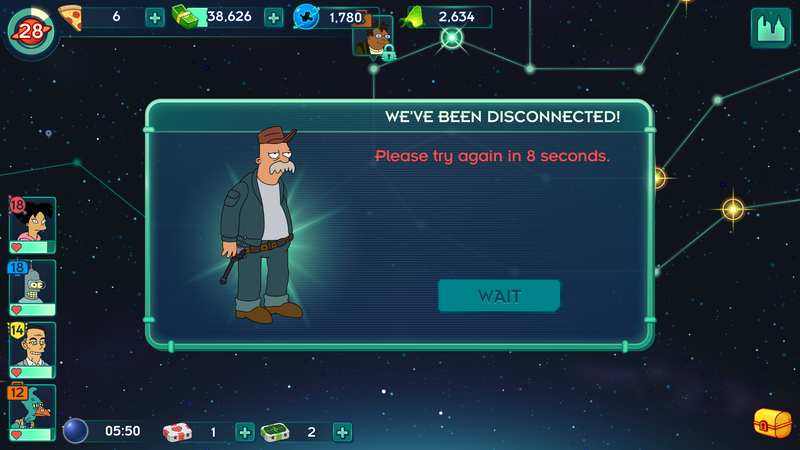 It gets stuck in a loop of asking you to reconnect and then telling you to wait 10 seconds so that you can try again and every time I’ve seen this screen I’ve had to kill the app and launch it again. The stability has increased somewhat since it first launched, but it’s definitely something the developers should be working on as a priority. 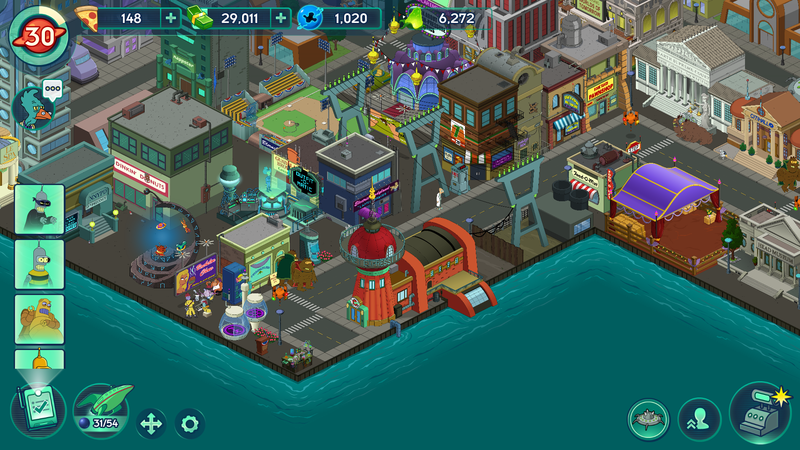 While I don’t know if it’s something I’ll keep playing long term like I did with Tapped Out!, as I have a lot more ongoing games that I’m playing these days, I’m really enjoying Futurama: Worlds of Tomorrow so far and I’ll definitely be sticking with it at least until I’ve unlocked all of New New York and finished the storyline. As a Futurama fan, having what amounts to another series of episodes is definitely something I can’t pass up. Between big new releases and starting a new job a couple of months ago, I’ve not had a lot of time to continue working through my backlog of older games. Considering it’s now August and I’m writing about a game from ‘A’ still, it just goes to show how well I’m doing. I think I’ve already somewhat tired of just working down the list in alphabetical order though, so I think I’ll end up playing something that doesn’t begin with an A next. But that’s next time, today is Ace Combat: Assault Horizon. While I’ve been aware of the series from a distance for quite some time, I’d never previously gotten around to playing an Ace Combat game. I’m not even sure why, really.. I enjoy arcade flight games in general and there aren’t all that many of them so I’d have expected to actually play one before now. Perhaps it was mostly down to them not being released on a platform I have while that was my dominant console, at least in the early days. I played almost exclusively on the Nintendo 64 and PC during the late 90s, and by the time I was playing on consoles concurrent with a game release it was already 4, 5 or 6 titles into the series and that always feels like something of a barrier to entry to me. 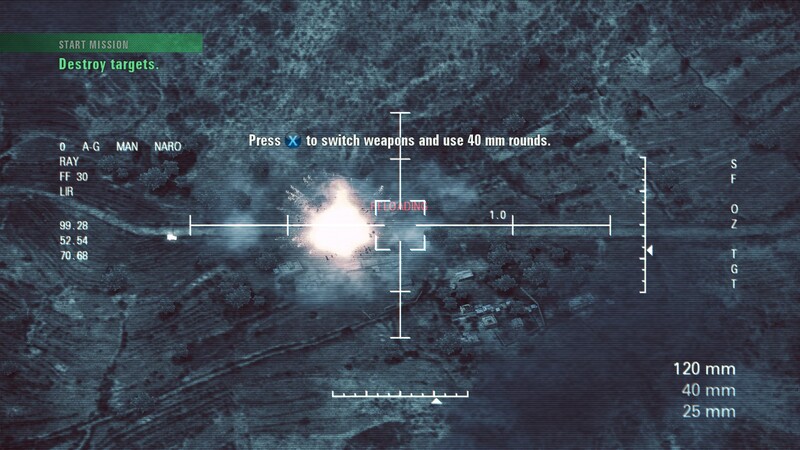 All this means that Assault Horizon is my first Ace Combat. Even before I started playing, I was aware that series purists weren’t exactly fans of this one so I went in with somewhat lowered expectations. 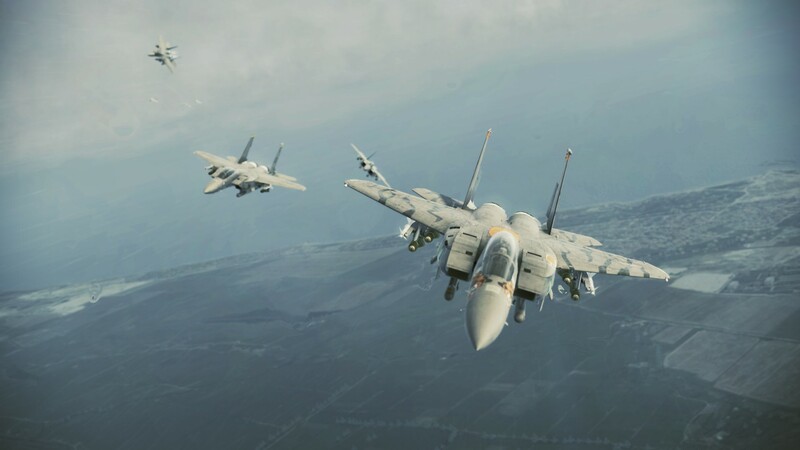 Most of the previous games in the Ace Combat series had been set in an alternate universe, known as Strangereal, on a version of Earth with different continents and countries but with (generally) real designs of fighter planes. Assault Horizon on the other hand, is set on what’s intended to be the real world so all of the missions are set in and featuring existing places and countries. I understand that, on release, many at the time felt that this was intended to be a reboot of the series (if that was the case, those plans are no more as next year’s Ace Combat 7 is back in Strangereal) into a more gritty realistic one which very likely will have contributed to the general dislike from the fandom. None of this meant anything to me going in of course, and in a way I’m somewhat glad that it’s a break from previous games as it meant I wasn’t ever wondering if I was missing anything. Assault Horizon follows a joint NATO group of fighter squadrons led by Colonel William Bishop of Warwolf squadron. It’s honestly not all that memorable a story and mostly exists as a framework for making you go to different parts of the world – while playing it I felt very much that it was the Modern Warfare of flight sim games which I still feel is somewhat accurate. The plot isn’t really all that memorable to be honest, and has your these days standard Modern Warfare/Tom Clancy kind of thing with traitorous Russians and experimental superweapons and the like. It’s basically action movie level of plot engagement – I didn’t particularly care about the logic or details of what was going on, because the things going on let me fly shiny fighter planes and blow things up. And what shiny planes they are. Assault Horizon features nearly 40 flyable aircraft, made up of mostly fighter planes but also a small selection of other types of craft such as helicopters and bombers. 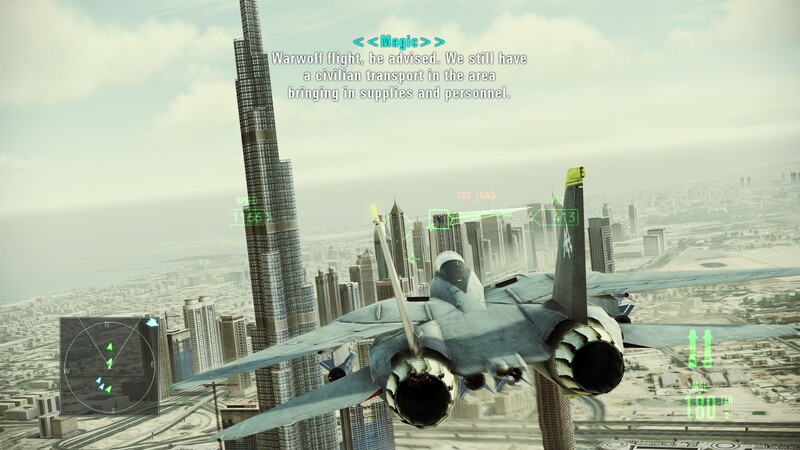 The majority of the craft are real world designs of planes past and present, as well as a few that are currently prototypes but there are also a couple of completely fictional aircraft from other games in the Ace Combat series. The vehicle models are incredibly detailed, and look exactly like you would expect them to with tons of moving parts like flaps and exhausts and so on. Each craft also has a number of selectable camouflage styles. These include a mixture of real life styles, ones based on previous games as well as promotional skins for other Namco games such as the very subtle Pac Man deco I flew a mission in that most definitely wouldn’t have made me an incredibly obvious target. While the vehicle models look great, the characters that populate the cutscenes between missions don’t fare so well unfortunately. Even bearing in mind that Assault Horizon is an slightly older game, having been released in 2011, the characters are poorly animated and unrealistic and have this plastic look that was more common in the early Xbox 360 days circa 2005. I’ve seen far worse, but they’re astonishingly average. 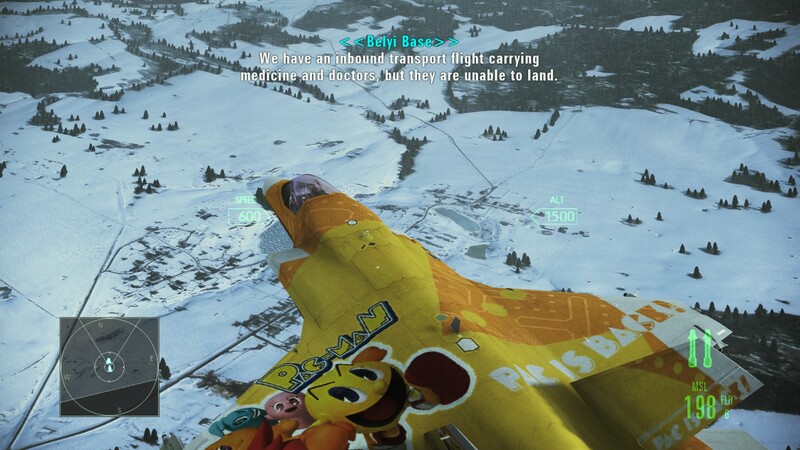 This isn’t a terrible problem, being as they’re only present in the cutscenes and never in any gameplay but it does feel a little jarring going from really pretty and detailed fighter planes to rubbish characters, and it probably didn’t help all that much with me paying attention to the story either. Most of the game’s missions are based in fighter planes with you playing as Colonel Bishop. These missions are essentially the classic Ace Combat gameplay but with an extra feature that’s drawn most of the fire from some long time fans of the series, but I’ll get back to that in a moment. 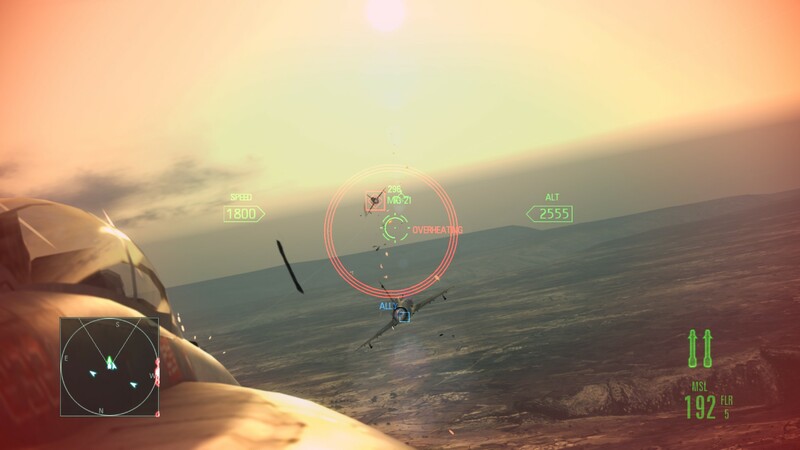 Despite the simulator level of detail on the planes, Ace Combat is an arcade style game so there isn’t excessive levels of detail to the controls. 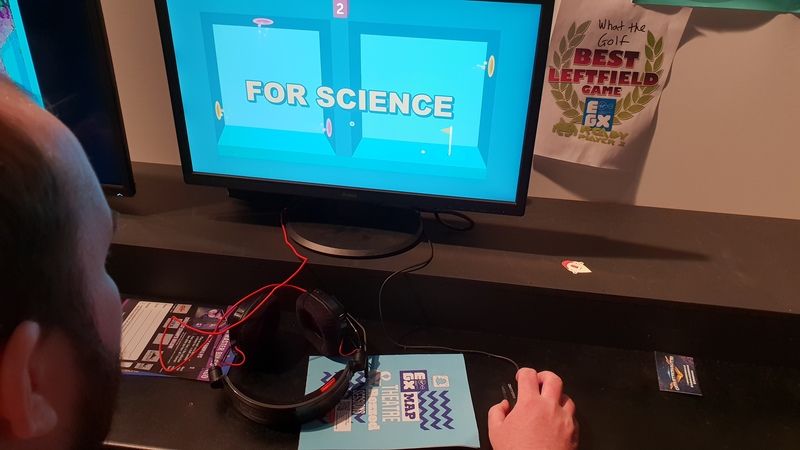 You accelerate with the right trigger and decelerate with the left, the bumpers roll the plane left or right and the face buttons are target selection and weapons. The controls are simple and easy to pick up, but really effective and I never found myself in any real difficulty maneuvering the plane around. The controversial feature, at least as far as a lot of the fandom are concerned, is the Dog Fight Mode. When you’re attacking an enemy fighter and have it in a target lock at close range, a circle will appear around your targeting reticle. As you get closer this circle will shrink until it finally turns red and if you then press both the bumpers together you enter Dog Fight Mode. 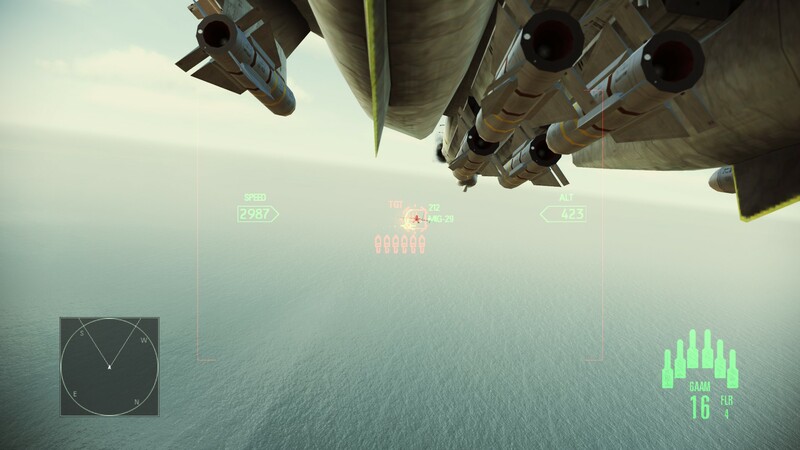 When you’re in DFM the camera shifts to the underside of the plane or to just over one of the wings and focuses on the weaponry there while giving a clear view of the target, as well as entering esssentially an auto pilot. You can move the reticle around on the screen to better target the enemy fighter and attack with greater accuracy to bring them down quicker. I personally quite liked DFM as it made some of the fights feel even more intense, but I can see how such as massive addition or change to a series’ established gameplay can draw some criticism. 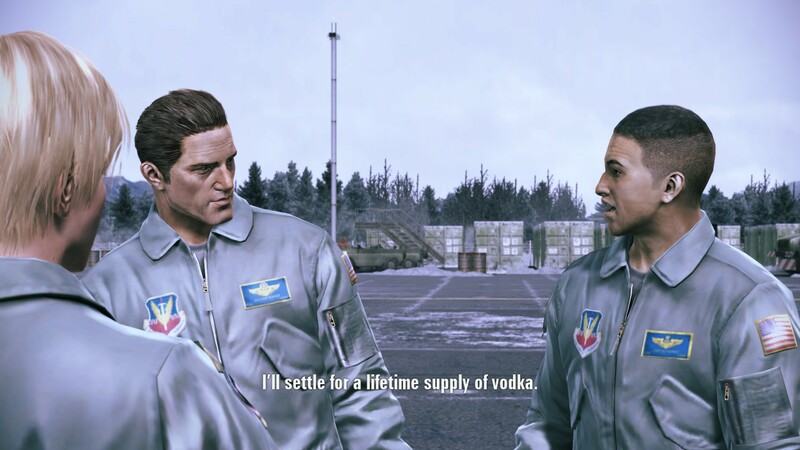 The handful of missions where you’re not in a fighter have you playing as an airman from one of Warwolf’s various supporting squadrons. 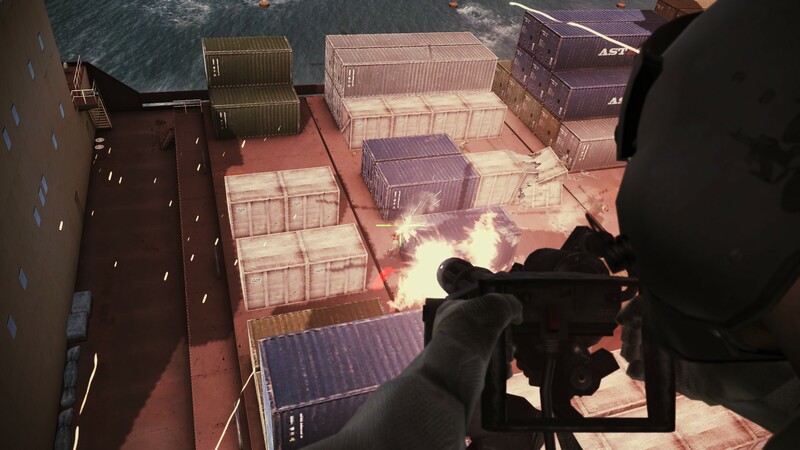 A couple of missions give you direct control over a helicopter which I found to be quite clunky, especially when compared to how well planes control, and instead use the triggers for attacks which felt somewhat counter-intuitive after hours of using the face buttons. 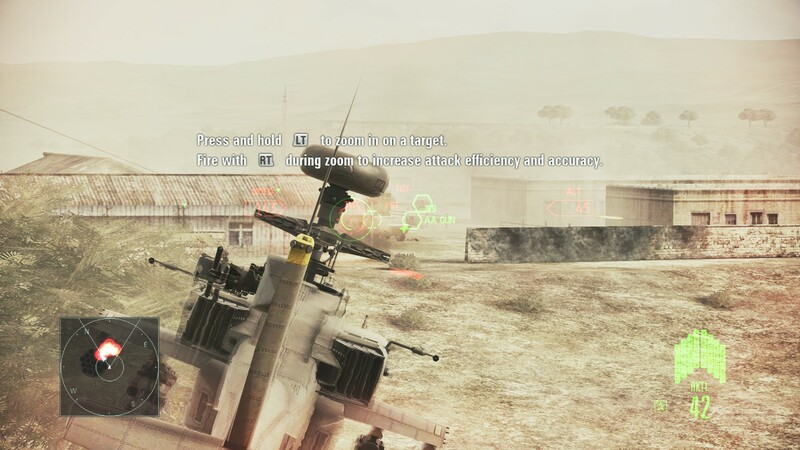 There are also missions where you man the side guns on a helicopter gunship, fly a bomber to destroy some larger targets and finally the now-obligatory AC-130 gunner sequence that so many games in the post-Modern Warfare world have felt the need to include. None of these were particularly terrible, but they weren’t as fun as flying a fighter so in some ways feel somewhat pointless but I understand the logic of trying to give a bit of variety in gameplay. I did feel that most of the missions were a little too long, many were paced into several acts or phases that I feel would have been better split into separate missions. Some later missions can take over half an hour to finish, and I think that’s too much for a single unbroken section of arcade gaming. The auto save in missions is quite generous though, and you can quit mid mission so on the odd occasion that I was playing during my break I didn’t have any real issues with just quitting and picking back up where I was. One thing that stuck out to me almost immediately when I started the game up was the score, as it’s really really good. In particular the main theme that’s peppered through the score and comes up regularly during epic fights comes back to that feeling of being an action movie and really works well, but the rest of the tracks are almost as good and there’s tons of atmosphere from the music alone. The character voices, rather like the models themselves, are entirely unexceptional though at least are largely serviceable with the exception of a few dodgy accents. At least all the action noises such as the planes, weaponry, explosions and so on sound decent enough. Despite the mission length, there aren’t all that many of them so it isn’t a terribly long game overall. That’s not necessarily a bad thing as it never wore out it’s welcome and the 11 hours or so that I spent on it felt to me like a decent length for the game. The missions can all be replayed once you’ve completed them should you wish to try out other planes, go for any missing side objectives or achievements and the like, which can extend your play time somewhat too. All in all, I rather enjoyed my first Ace Combat experience. 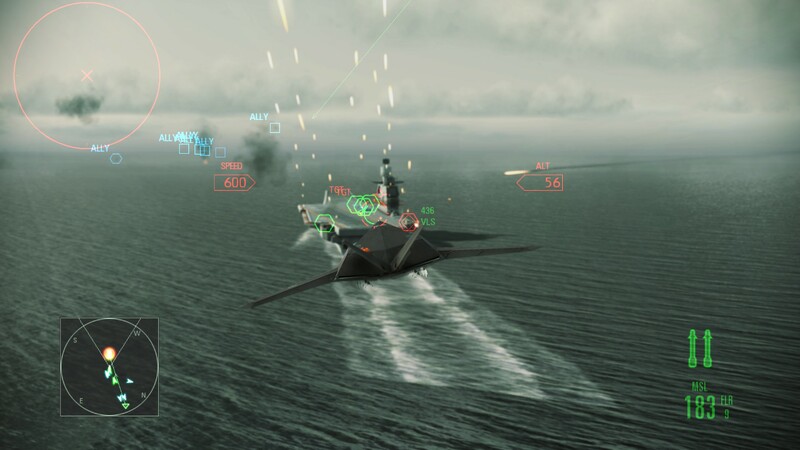 I’m now very much looking forward to the release of Ace Combat 7 on PC next year, and will certainly consider going back some of the previous games in the series before then – the confusingly titled Ace Combat: Assault Horizon Legacy on the 3DS (which is actually a remake of Ace Combat 2 with no story links to Assault Horizon) will probably be my next Ace Combat before 7 comes out.